Unite Hector Watt, a veteran of Austin’s Solid Senders, the band that perhaps sounded the most like the Fabulous Thunderbirds that was not the Fabulous Thunderbirds; Chris Ruest, who has been quietly building a reputation as one of the toughest blues guitar players on either side of the Atlantic; and the truly legendary Preston Hubbard, whose résumé includes Roomful of Blues, the Fabulous Thunderbirds, Nick Curran’s Nite Lifes, Los Carnales, and many other projects elevated by his low frequency work; and you have the core of Texas Cannonballs. Despite possessing the makings of a top-flight blues outfit, and although they share their name with a well-known, late-period album by Freddie King, the Cannonballs’ new project is cut from a pattern of dangerous rock ‘n’ roll. The riddle at first seems insoluble. Why would three players of such esteem turn away from the blues? To Watt, who shares guitar and vocal duties with Ruest, the answer is a simple desire to change things up a bit. “A 100 percent blues album was out of the question. It’s been done over and over, time and time before,” he told Ellie Rumbold of forfolkssake.com. And while a blues recording from these musicians could hardly have disappointed, we can be grateful for the Cannonballs’ decision to move in another direction. Their self-titled début delivers thirteen songs that emerge hard-edged from the speakers, glinting like switchblades under streetlamps. With the exception of the two numbers by Jerry McCain–an unhinged, Cramps-worthy take on “I Want Somebody To Love” that ups the ante on the original, and a blistering “Geronimo Rock”–that set the table for the rest of the set, Ruest and Watt split the songwriting more or less equally. The album opens with Watt’s “Fly Away,” a swampy track with a loping, soulful groove, and stinging lead guitars. His “Hard Way,” an infectious, bouncing roots-rocker co-written with Lou Ann Barton, feels rowdy as a lost McCain tune and recalls the Stones at their Chuck Berry-inspired best. Along the same lines is “Me and the Devil,” a swaggering number enhanced by Temple Ray’s backing vocals. “Texas Tumbleweed” features prominent slide guitars straight out of Mick Taylor-era Stones (“All Down The Line”), and sounds like something Doug Sahm might have cooked up with one of Alejandro Escovedo’s old bands (Rank and File or True Believers, take your pick). “King of the Jungle” rides a chunky, push-pull rhythm, very vaguely reminiscent of “Long Cool Woman in a Black Dress,” and has a great lyric; I can’t decide whether the guitars or the vocal have more snap and snarl. Also snarling is the ominous “King of the Blues,” an oily, garage blues worthy of Iggy and the Stooges. The prisoner’s lament “Dreaming” closes out the program with a quiet, acoustic arrangement that blends Stones-y country elements with notes of Johnny Thunders’s occasional ballads. Ruest proves to be no slouch in the Stones department, with his amazing “One Slip” showing off some of the chunkiest Keith-inspired riffs on record. He also contributes “Blew My Head,” a slinky, riff-based rocker à la the T-Birds’ “Powerful Stuff,” but with a distinctly darker mood. Just as complex is “Nobody Cares About Me,” a chugging, R&B-inflected rocker, downshifts into a minor key, complete with spooky, raked chords, for the choruses. 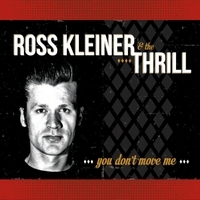 His “I Was Wrong,” another minor number, is the closest thing to a pure blues among the original compositions. Its feel shifts dramatically from stop-time verses to a shuffle feel during the choruses and the dynamic solo break. Neither of these songs would sound out of place on a record by the mighty Paladins. 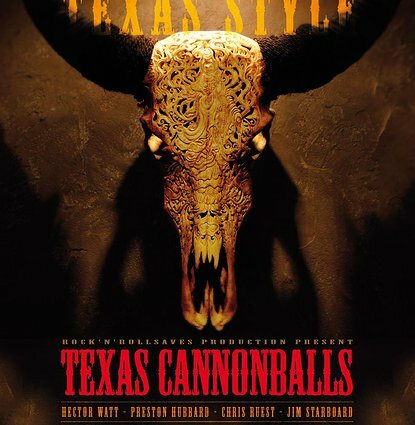 I have dropped a lot of names during the course of this recap, solely in the interest of providing some kind of frame of reference–signposts marking the general territories in which Texas Cannonballs work. The Cannonballs have in fact made something quite original of familiar materials. Think of the Flamin’ Groovies jamming with Omar and the Howlers, and you might come close to the soundscape they have created. It is raw yet sleek, with an underlying sense of menace and drive rarely heard since Exile On Main Street, and unrelentingly cool. The CD for this review was kindly provided by the band’s management. Nick Curran’s death was without question the worst news I received in 2012. Second on my list was the breakup, right about the time their second album was to be released, of the Stone River Boys, the country soul band fronted by Dave Gonzalez and Mike Barfield. As has been said, one door closes, another opens. 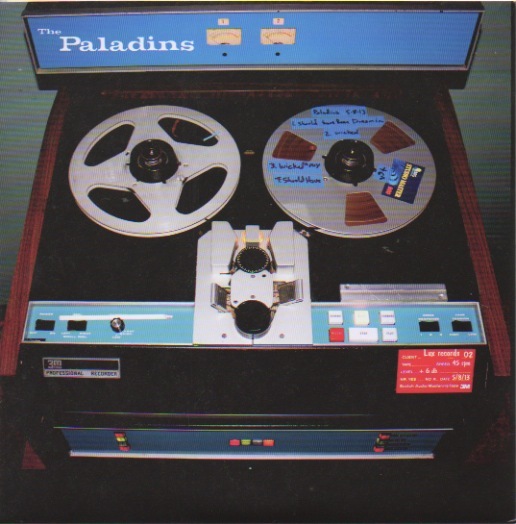 Just as the Stone River Boys offered musical consolation after Chris Gaffney’s death in 2008 put a premature end to the sublime Hacienda Brothers, Gonzalez’s previous band, so have recent developments rekindled hope that the mighty Paladins will rise again. In the past few months, an official Facebook page has appeared; a few live dates have been scheduled and played; and a 45 rpm vinyl record presenting two new songs has been issued by Lux Records. 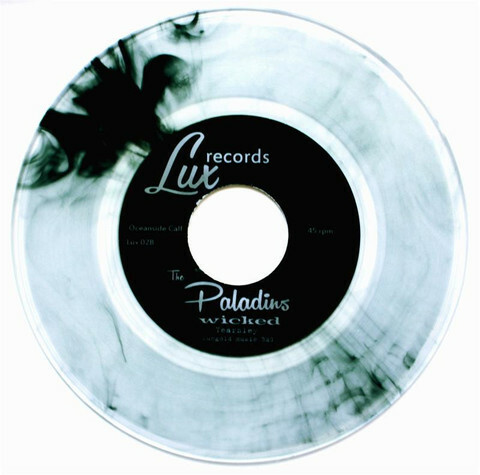 The last great Paladins lineup of Dave Gonzalez (guitars and vocals), Thomas Yearsley (bass), and Brian Fahey (drums) is reunited on this 7”. Briefly, the single is essential listening for R&B aficionados in general, and, although the band’s roots-rocking side is sublimated here in favor of the soul sounds Gonzalez developed in the Hacienda Brothers and SRB projects, for Paladins fans in particular. “Should Have Been Dreamin’,” the record’s instrumental A side, reaches back to the mid-‘60s for a sweet soul/rock ‘n’ roll combination, with splashes of surf. Organ, guitar, and baritone guitar outline a lovely melody atop a soul-clap snare drum pattern. A leisurely paced number that builds in intensity, it reminds me in a small way of the dreamlike interpretations by Ry Cooder and Duke Levine of “It’s Gonna Work Out Fine” (but not Ike & Tina Turner’s stuttering original). The hip flip side, “Wicked,” is a blues/pop/rock/soul number. There are some very cool rhythmic things going on, with the palm-muted staccato guitar figure sketching a vaguely Latin groove. Quick, stark shifts between minor key verses and romantic, major key interludes that suggest the soulful work of Thee Midnighters produce an uneasy feeling. Haunting organ, bluesy guitar, an ominous lyric, a spoken section heavy with echo, and a key signature that tests the top end of Gonzalez’s natural singing range all add to the song’s dramatic impact. The Paladins are back. Let’s hope these two excellent songs presage a full-length album. In the meantime, this boss single is a limited edition release, so get it while you can. I bought this single from the Lux Records Web site.